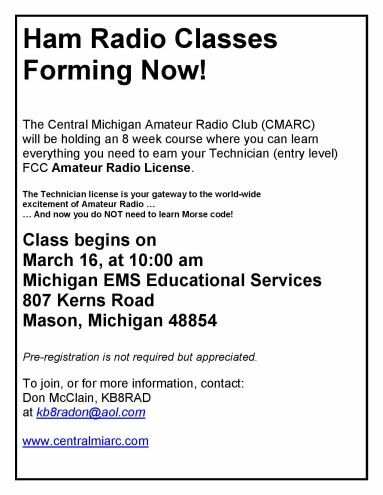 CMARC offers amateur radio licensing classes from time to time. There are three levels of amateur radio licenses, Technician, General, and Extra. Each level of amateur radio license requires passing a written exam. There is no age requirement for obtaining an amateur radio license. All levels of amateur radio exams are administered by Volunteer Examiners (VE’s). See VE Testing for more information on the exam process. The Technician license is the entry license into amateur radio. The Technician license is primarily aimed at Very High Frequency (VHF) and Ultra High Frequency (UHF) operation, although there is some High Frequency (HF) operation allowed. The General license offers greater privileges than the Technician license, particularly greatly expanded High Frequency (HF) privileges. To take the exam for the General license requires holding a current Technician license or successfully passing a Technician license exam. The Extra license offers all amateur radio privileges, including some frequencies limited to Extra licensees only. To take the exam for the Extra license requires holding a current General license or successfully passing both the Technician license and General license exams. All license classes are held at Michigan EMS Educational Services, 807 Kerns Road, Mason, Michigan. map Classes are typically two hours duration and are free, but we do recommend purchase of the appropriate ARRL licensing manual. Each license manual retails for $29.95. A spiral bound version is available for $32.95. If you cannot afford to purchase a license manual, you may be able to borrow a license manual from our lending library. Visit Lending Library for information about CMARC’s Lending Library. Knowledge of Morse code is NOT required to pass an amateur radio license exam. For more information about licensing classes, or licensing and testing procedures, please contact Don McLain KB8RAD at (517) 930-7707. Don can provide answers to questions you may have!